Displaying 1 - 60 of 75 items found. Black fabric with dots, a twist on the black solid of Amish quilts, creates movement in this star-design bed quilt. Finished Quilt Size: 88" x 102". Block Size: 14" x 14". Center a design motif from your favorite print in each block of this simple, quick-cut and quick-pieced wall quilt. Finished Quilt Size: 42 1/2" x 42 1/2". Block Size: 12" x 12". Four-Patch blocks form angel shapes on this runner and matching Christmas stocking. Table runner size is 14" x 49". Stocking size is 9 1/2" x 18 1/2". The use of a beautiful border stripe will help focus on colors and make borders a breeze. Finished candle mat size is 14 1/2" x 14 1/2", although that may vary according to the width of your border stripe. Hang a tiny ornament on this little Christmas tree every day, topping it with your favorite on Christmas morning. Wall Quilt Size: 24" x 24". Candle mats make wonderful Christmas gifts if you can bear to part with them! Finished candle mat size is 20" x 16". Celebrate the holidays by sewing up this fun Christmas block. Includes printable pattern for paper piecing. A variety of burgundy and green fabrics combine to create a scrappy look in this pretty holiday quilt. Finished quilt size is 52 3/8" x 52 3/8". Choose any size preprint Christmas motif as the centers of this crazy patchwork quilt. Size: 42" x 42". Diamonds are worth a lot of money, but Christmas brings us something more valuable than money. Christmas day is celebrated because God came to Earth as a baby who grew up to be the Savior. Finished quilt size is 60" x 90". Get into the spirit of the season with a Log Cabin Christmas quilt. This easy free quilting pattern is a classic that you'll enjoy for years. This would be a great DIY gift for a newly married couple. They'll treasure it season after season. Quilt size: 24 1/2" x 28 1/2". This happy reindeer is spreading joy on this holiday banner. Finished Banner Size: 18" x 33". Colors of the season combine in a pretty table runner. Quilted table runner size is 48" x 24". Dress up your table with a holiday runner to accent your decorations. Finished table runner size is approximately 18" x 65". Every room of your house deserves to be decorated for Christmas. Stitch this free pattern and bring a little cheer to the bathroom too! Easily create a tank runner, a toilet cover and pretty hand towels. This pattern isn't just for Christmas, either. Choose any type of fabric you want! Strip Width: 2 14"; Tank Runner: 6 1/4" x 22"; strip piecing. Take one Christmas print and lots of scraps, then churn them together to create this wall quilt based on the Churn Dash pattern. Finished quilt size is 33" x 33". This cheerful kitchen set consists of an apron, a scented trivet and a mini-wall quilt. The tree motif is a snap to make using strip-piecing methods. We often avoid this pattern because it is too challenging. Give this one a try. It works! Finished candle mat size is 12" diameter. Compass size is 10" diameter. The tree designs used in this place mat reflect the importance of the tree to the Christmas season. Size: 12" x 18", pieced, templates. Neat preprint Christmas motifs are plentiful. Use 4" motifs with Christmas prints to quickly make this decorative wall quilt with a folk art flavor. The finished wall quilt size is 23" x 28". 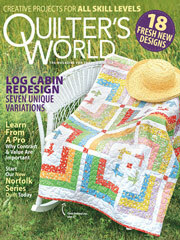 Imagine the fun of constructing an entire quilt with just one pattern piece. At home, traveling or waiting for appointments, you can work on your design and finish it with a flair. Finished quilt size is 94" x 108". Each yo-yo is approximately 2" diameter. These hot mats may be used at any time of the year, but are perfect accent pieces for the holiday when made using red and green fabrics. Finished Mat Size: 9" x 9". Block Size: 5 5/8" x 5 5/8"
Add your most creative quilting designs to the generous background pieces on this festive appliqued wall hanging. This e-pattern was originally published in A Quilted Christmas. Size: 12" x 52", including cord, tassel and hanger. Line up these little snowmen to make a decorative winter scene. Finished Snowperson Size: 3 1/2" high. Tie a piece of candy in the center of each Nine-Patch block to count the days until Christmas. Size: 22" x 30", pieced. These paper-pieced cards or tree ornaments are fun to stitch and make great gifts. Size: Tree: 3 3/4" x 4 1/2". Santa: 3 3/4" x 5". If you don't have room to set up a full-size tree, make this hanging tree to celebrate the season. Finished quilt size is 31" x 34".